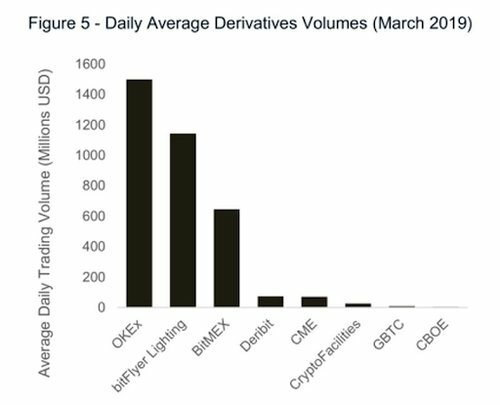 Even before the April breakout of Bitcoin (BTC), derivative Bitcoin markets saw strong volume during the month of March. 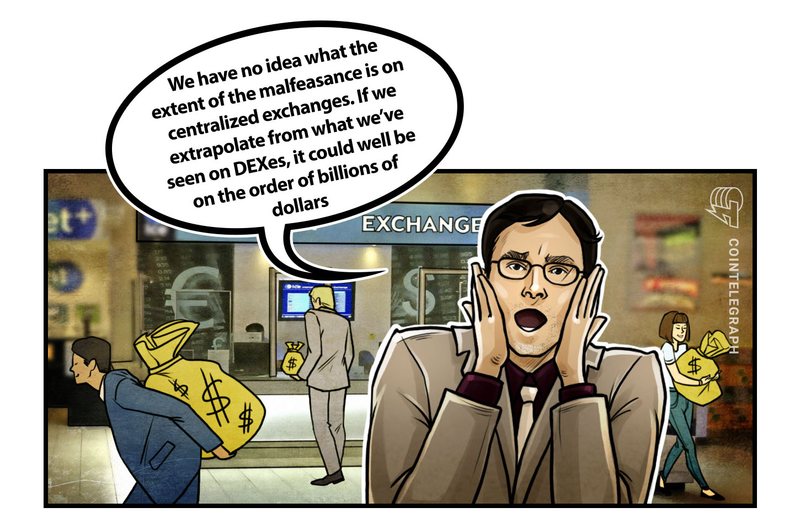 According to CryptoCompare’s most recent exchange review, OKEx exchange traded $1.5 billion in average daily bitcoin derivative volume. The above exchanges all benefit from being registered in more crypto-friendly jurisdictions and thus have fewer KYC requirements than more institution-focussed exchanges offering Bitcoin futures. The CME, a US registered exchange, offers such a highly regulated Bitcoin product – but the trading volume on this exchange is paltry (about $70 million daily) compared to OKEx, bitFlyer, and BitMEX, owing to the difficulty involved in being approved to trade on such platforms. Continuous retests (below, purple circles) of Bitcoin’s key $5,350 resistance zone seem to confirm the presence of an ascending triangle, a bullish pattern. There has not been sufficient volume, however, to punch through this key level. This pattern still has all of April to play out. A retest of the bottom regions of the pattern, at $5,100 and above, would be normal and even likely after repeated small rejections during the latest attempt up. Volume was so weak on these movements that they could hardly even be called attempts. 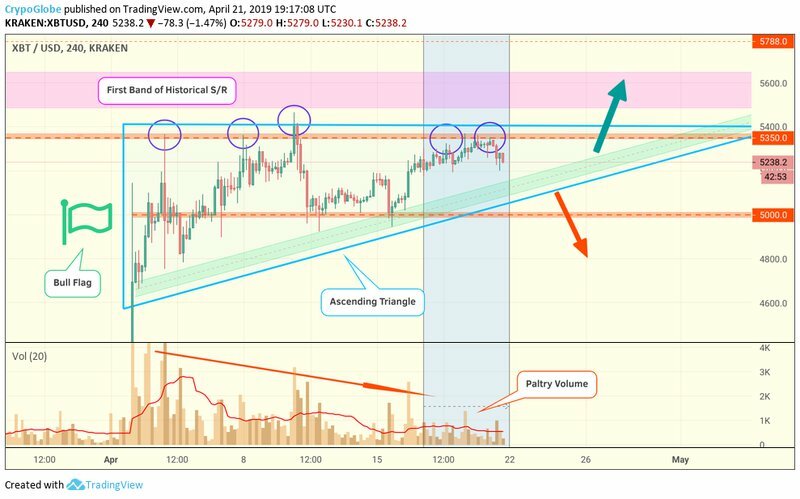 On the other hand, some chartists are recognizing the presence of a symmetrical triangle rather than an ascending triangle, with the top pole located at the top of the April 10 false breakout. While these patterns are similar in that they are consolidating patterns, the former one is not inherently considered bullish whereas the latter one is. 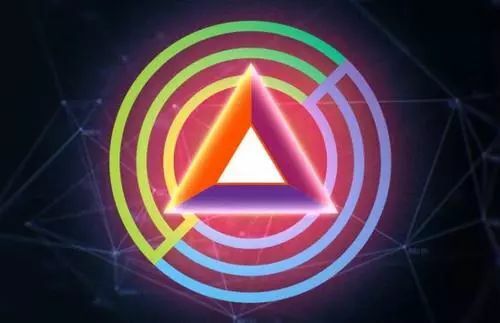 Indeed, the price has been contained – barely – within this symmetrical triangle range. Bitcoin is currently on a downward leg within this structure and approaching key support at $5,180. This level marks the rough midpoint of the structure, and also the first regions of the rising support trend band (in green, below). Traders should watch the volume in the next few days, which may give clues as to BTC’s breakout direction. Both of these consolidation patterns transpire toward the end of April, and in either case a long term bullish bias is suggested. We can say this because of Bitcoin’s dogged refusal to drop below $5,000, which is an impressive feat given the strength of the shocking April 2 breakout. A deeper retrace could have easily been accommodated without worry, anywhere above $4,500-600. What’s more, a Golden Cross is impending within a matter of days – two or three – which is commonly thought of as a very bullish long term signal. However, seeing as this event has been priced into the market for a while already, it may not mean positive price action in the short or even medium term. A breakdown after a Golden Cross would not be impossible, especially if it were a temporary one. In the eyes of analysts across the board, Bitcoin (BTC) decidedly bottomed at $3,150. 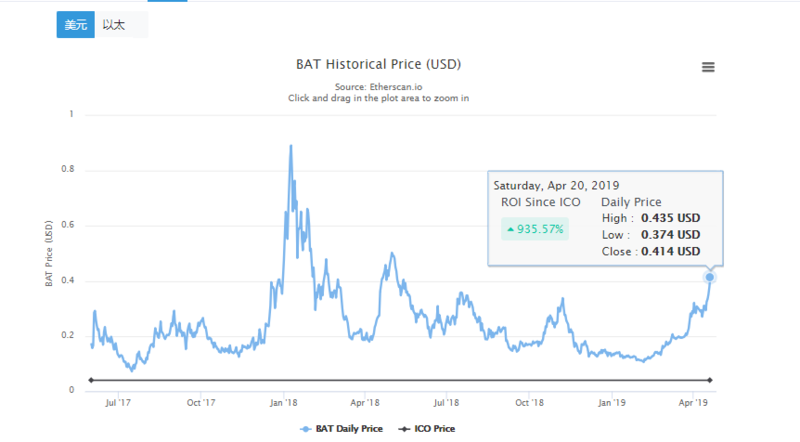 They cite the fact that at $3,150, BTC was down 85% from its all-time highs, which is where the crypto asset has bottomed in previous cycles, coupled with the idea that industry fundamentals are better than ever. And so far, this call has been vindicated, as BTC now sits at a casual $5,300. However, some pundits fear that a so-called “black swan” event could still strike this market, forcing Bitcoin and other cryptocurrencies to enter a freefall. Let’s take a look. Adamant Capital, an Alpha-seeking Bitcoin fund, recently released its latest report about the state of cryptocurrency markets. While the report, titled “Bitcoin in Heavy Accumulation,” had bullish undertones, its authors, which includes prominent analyst Tuur Demeester, weren’t remiss to not mention the cases for lower lows in this cycle. 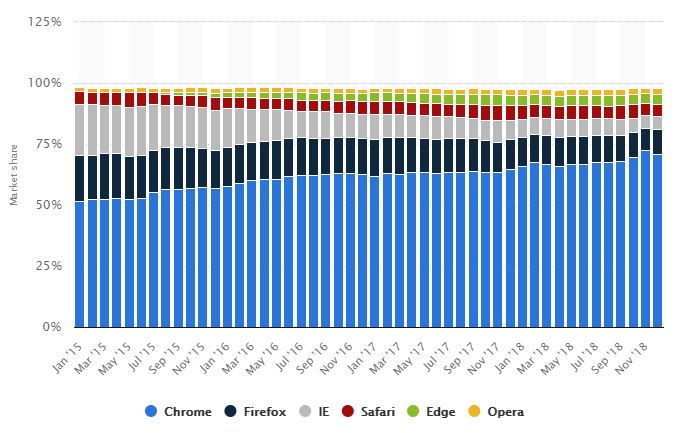 Adamant’s researchers and partners gave three/four cases for a collapse to new lows in the coming months. 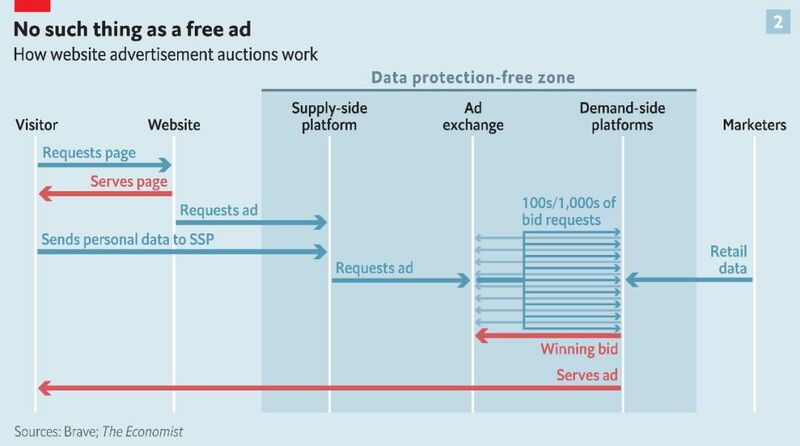 First, hacks or failures of exchanges and other infrastructure providers. While the unwinding of the 2013 rally was partially a result of natural cycles, some of the drawdown was catalyzed by the decimation of Mt. Gox, hacked for hundreds of thousands of BTC. Adamant postulates that if a similar event occurs in the coming six months, Bitcoin markets could see a negative demand shock. Second, a macroeconomic crash. Although cryptocurrencies have been lauded as non-correlated assets to stocks, it was proposed that a collapse in traditional markets could create a situation similar to the “2008 paradox” of the value of gold falling by 30%, even as demand surged. 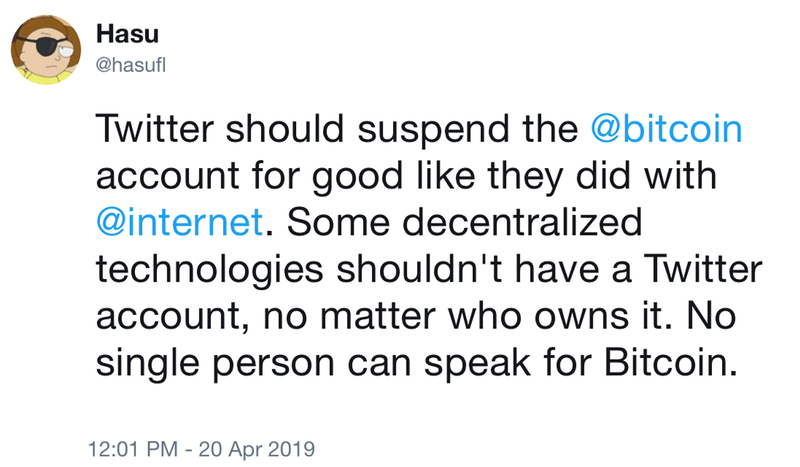 Last, a “secondary Bitcoin mining capitulation.” Adamant remarks that while miners have already capitulated in this cycle already, if BTC “drifts down” to $3,000, this capitulation could be replicated as miners go out of business en-masse. More likely than not, however, Bitcoin has bottomed. As reported by NewsBTC previously, the same report showed clear signs that BTC is in accumulation. It was explained that the Bitcoin Unrealized Profit/Loss (BUPL) indicator, which aims to estimate how much BTC holders’ are cumulatively profiting or losing, is reading at $13 billion in the positive. If the indicator is adjusted for the approximate number of lost coins, however, BUPL currently reads at $3 billion — 3% — of unrealized losses. While this doesn’t sound all too important, as the measure is lesser-known, as Adamant explains, the recent BUPL movements confirms that Bitcoin has exited a “capitulation” phase, entering into a stage of “hope” (and fear). It is important to note that when BTC exited the “capitulation” phase during 2014 to 2016’s cycle, there was strong BUPL uptick, as we are experiencing now due to Bitcoin’s recent rally past $5,000. What’s even more optimistic is that the 60-day volatility chart for BTC is currently sitting at 5%, a level not seen since late-2016, and even fell as low as 2% in early-November 2018. This, as Murad Mahmudov once explained, shows that a Bitcoin rally could be on the horizon. The crypto markets have dropped slightly today after tepidly climbing higher over the past week. Despite this, Bitcoin (BTC) has been able to firmly establish its position within the $5,000 region and has not incurred any significant selling pressure after climbing towards $5,300. Although many analysts are currently looking towards freshly formed levels of support and resistance for where BTC is heading next, one technical indicator may signal that the cryptocurrency is on the verge of another bull run. At the time of writing Bitcoin is trading down less than 1% at its current price of just below $5,300. BTC is down slightly from its daily highs of $5,360, but did not incur any significant selling volume after nearing $5,400, which has historically proven to be a strong level of resistance for the cryptocurrency. 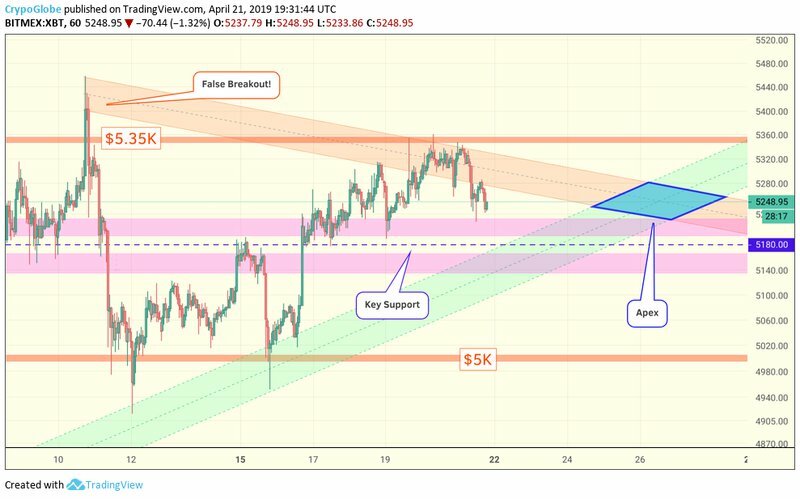 It now appears that Bitcoin is caught in a newly formed trading range between approximately $5,000 and $5,400, with its support level first being formed when BTC treated $5,000 as a level of strong support on April 11th. Flood, a popular cryptocurrency analyst on Twitter, explained in a recent tweet that he is looking towards the $4,900 to $5,150 price range as an area in which he will buy more Bitcoin. “I’m a buyer from 5150 to 4900. That is all,” he concisely noted. Because Bitcoin has been unable to break above the upper boundary of the aforementioned trading range, it is probable that it will revisit the lower-$5,000 region in the near-future. Bitcoin’s relative strength index (RSI) – which is an important technical indicator that many analysts use to gain insight into whether or not an asset is overbought or oversold – is nearing a level that has historically marked the start of previous bull runs when broken above. Cow Jones, a cryptocurrency trader on Twitter, discussed this in a recent tweet, pointing towards Bitcoin’s historical RSI action as evidence for why this level could signal an imminent bull run. “Personally don’t use RSI much. However, this is an interesting fork in the road. Past bull market began with RSI above the boxed range,” he explained. As a relatively quiet weekend trading session wraps up and a fresh week begins, trader and investors alike will likely gain greater insight into where the crypto markets are heading next. • The above unforgeable costliness also creates a fallback in case the fee model doesn’t work (which is unlikely) or the social layer goes rogue with monetary policy. In an apparent first, the United States Financial Crimes Enforcement Network (FinCEN) has given a penalty to a California resident who has been accused of wilfully violating money transmission laws as a peer-to-peer virtual currency exchanger. The department noted that the move marks its first such enforcement action, thus setting a precedent. The defendant — Eric Powers of Kern County, California — has been fined $35,000 and debarred from future work that qualifies as a money services business. The fine came from the determination that Powers violated his reporting obligations under the U.S. Bank Secrecy Act. 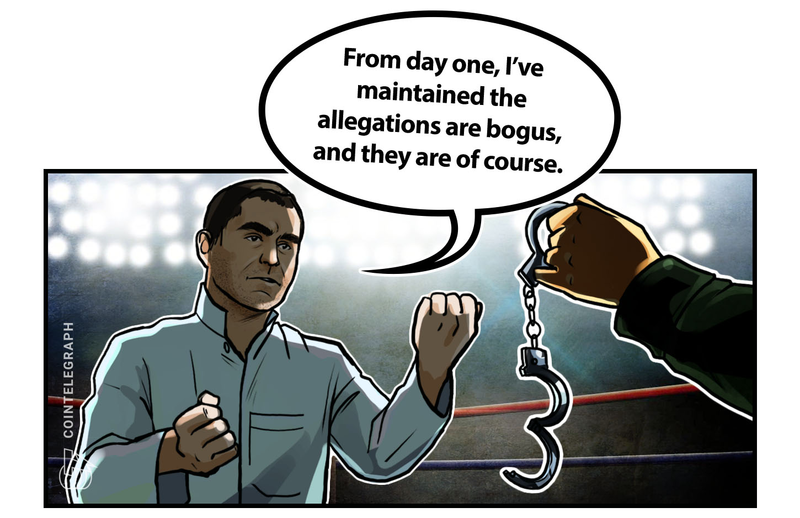 Craig Wright, the chief scientist at nChain and founder of bitcoin SV (BSV), filed a libel claim in the United Kingdom against cryptocurrency podcaster Peter McCormack. McCormack had previously accused Wright of fraud and falsely claiming to be Satoshi Nakamoto, the creator of bitcoin (BTC). In response, Wright’s claim allegedly requests over $130,000 in damages, as well as legal costs and court fees. 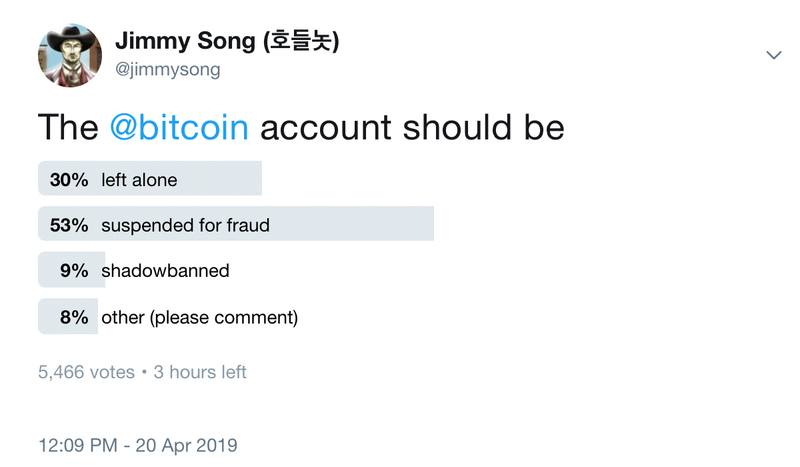 Earlier this week, Binance, ShapeShift and Kraken decided to delist BSV amid Wright’s continued claims to be Satoshi, as well as his bounty offering in the search for the identity of the anonymous Twitter user behind the Lightning Torch. Cédric O, France’s Minister of State for the Digital Sector, said this week that he is open to accepting cryptocurrency donations for the reconstruction of the Notre Dame Cathedral, which experienced a debilitating fire last week. The donations for the medieval cathedral’s reconstruction have already reached over $1 billion, while not yet allowing for donations in crypto. The official fundraising site is linked to four approved organizations, with Cédric O noting that the government is open to discussion on how to accept crypto to drive up the fundraising. 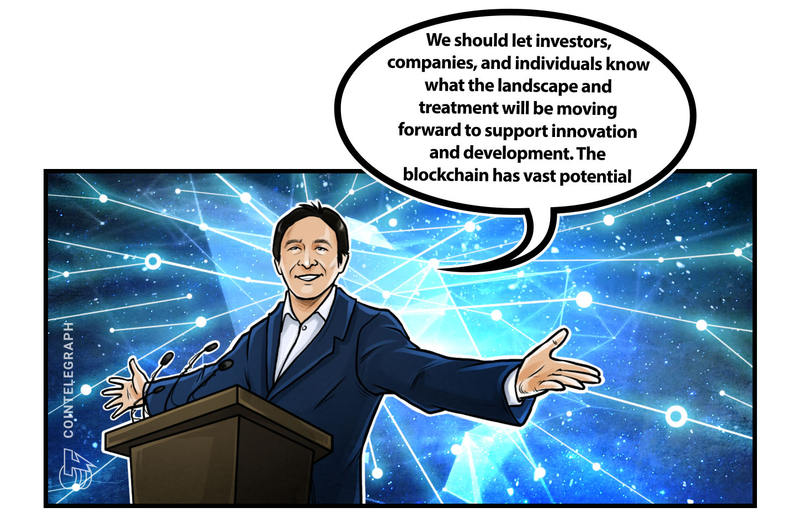 Both BlockShow, an international blockchain event powered by Cointelegraph, and major crypto exchange Binance have launched crypto donation campaigns for the renovations. Financial news outlet Forbes released their “Blockchain’s Billion Dollar Babies,” a list of companies implementing blockchain technology that have minimum revenues or valuations of $1 billion. 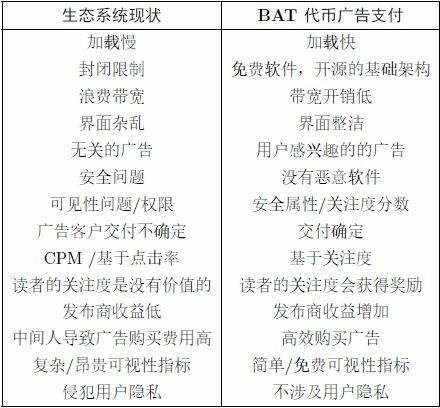 The list includes both companies in the crypto and blockchain development spaces, as well as larger companies in the traditional markets, such as banks and clearing houses, food companies and supply chain management firms. The list contains such household names as Amazon, Walmart, Facebook, ING, Mastercard, Microsoft and Nestle, as well as U.S.-based cryptocurrency exchange Coinbase, European mining and hardware firm Bitfury, and blockchain-based financial services network and XRP token creator Ripple. Switzerland-based food giant Nestlé, French supermarket chain Carrefour and IBM have partnered in order to use IBM’s blockchain tech to track French instant mashed potatoes. Shoppers will be able to use their smartphones in Carrefour stores to scan the packs of Mousline instant mashed potatoes with a QR code and be able to see data on the potatoes, including the varieties of potatoes used, the date and place of manufacture, and their journey to the store. In general, around 5 million different food items already employ blockchain in their supply chain in some form. At the end of the week, bitcoin is up, trading at around $5,348, ether at around $173 and XRP at $0.32. 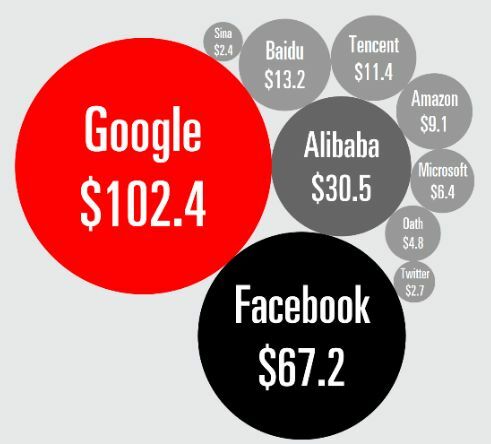 Total market cap is around $180 billion. The top three altcoin gainers of the week are fivebalance, atlantis blue digital token and segwit2x. 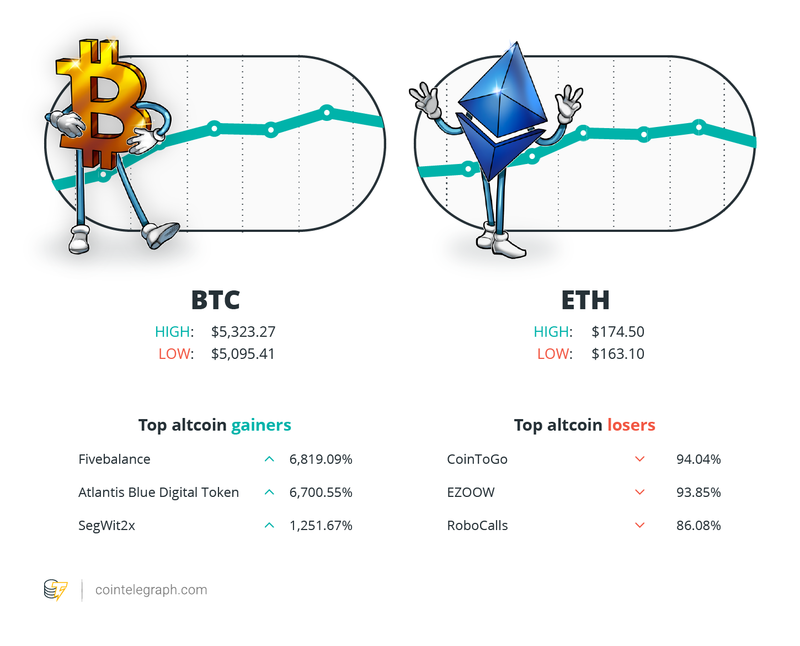 The top three altcoin losers of the week are cointogo, ezoow and robocalls. This week, following crypto exchange Binance’s announcement that they were delisting bitcoin SV, anonymous exchange ShapeShift has also delisted the currency, as well as Kraken. 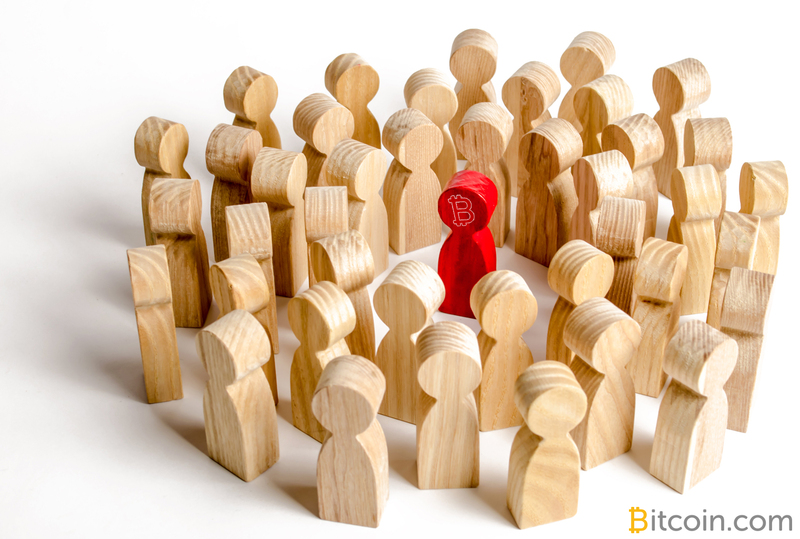 ShapeShift CEO Erik Voorhees posted on Twitter that the exchange stands with the sentiments of Binance and CZ, the CEO, in their decision to delist BSV following controversial claims from BSV founder Craig Wright over his alleged identity as Satoshi Nakamoto, as well as his public bounty to unveil the identity of anonymous Twitter user @hodlonaut. Shortly after, a community poll from Kraken led the exchange to also delist the altcoin. Unocoin, an Indian cryptocurrency exchange, has reportedly let go of half its staff, leaving the company with 14 workers. Unocoin cited regulatory uncertainty in the industry, noting that it made the decision concerning staff reduction ahead of an Indian Supreme Court hearing on cryptocurrency’s legal status in India, set for July. Since the peak of the business, Unocoin has allegedly fired 80% of its staff, and the business operations are reportedly running off of capital reserves as executives await news about the future. The crypto industry in India is in the process of fighting the country’s previous negative ruling on crypto dealings, in the form of a lengthy Supreme Court process. A group of individuals have been indicted by the Manhattan district attorney for allegedly selling drugs and laundering millions of dollars with bitcoin (BTC). According to Manhattan District Attorney Cyrus R. Vance Jr., with help from the U.S. Secret Service, the U.S. Postal Inspection Service and U.S. Homeland Security Investigations, Chester Anderson and his criminal accomplices, Jarrette Codd and Ronald Maccarty, allegedly operated dark web stores that sold and shipped hundreds of thousands of tablets of counterfeit drugs. According to the press release, the defendants laundered a reported $2.3 million in bitcoin by using preloaded debit cards and withdrawing cash at automated teller machines. After noting that Lagos, Nigeria, is the number one city in terms of the volume of online searches for bitcoin, Cointelegraph checks out how Nigerians actually interact with the top cryptocurrency. After this week saw a mass deslisting of Craig Wright’s bitcoin SV, Cointelegraph examines what caused the crypto community’s anger toward the self-proclaimed Satoshi Nakamoto. In Cointelegraph’s first-ever movie review, Emmy-award winning screenwriter Edward Zuckerman takes a look at the “Crypto” movie, finding (spoiler!) little to do with cryptocurrencies and a lot more to do with the Russian mob. The Neutral dollar provides diversified exposure, presenting a lower risk alternative against other stablecoins (which contrary to their name, may not exhibit stability) in the market. 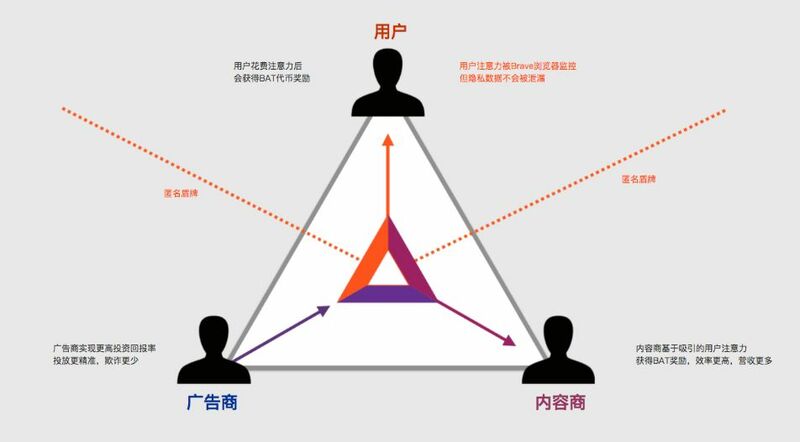 In addition, the Neutral Dollar functions in a way that creates an additional layer that allows for shared liquidity amongst constituents stablecoins, a property that isn’t inherent in their design. Given the fragmented and nascent nature of the crypto market structure right now, this solution is particularly relevant and unique in the marketplace. All eyes may be on Bitcoin (BTC), but other crypto assets have seen their fair share of gains since the start of 2019, sparking calls that what is known as “altseason” is right on the horizon. Per one prominent industry analyst, this cyclical industry event, which sees altcoins dramatically outperform the de-facto cryptocurrency lead, may actually be live as we publish this. Fundstrat’s prominent head of research, Tom Lee, recently took to Twitter to remark that one of the “pre-conditions” for historical altcoin rallies is coming to life in the current cycle. This precursor, for those unaware, is a drop in the correlation between the crypto asset class at large and Bitcoin itself. Per Lee’s chart, which cites data from Bloomberg, CoinMarketCap, and his own firm, a drop in the rolling 90-day correlation between the two subsets has preceded three altseasons — Mar 2016, early-2017, and late-2017/early-2018. An altseason, as defined by Fundstrat, is when a large percentage of altcoins in the “liquid universe” rally by over 200% in a short period of time. 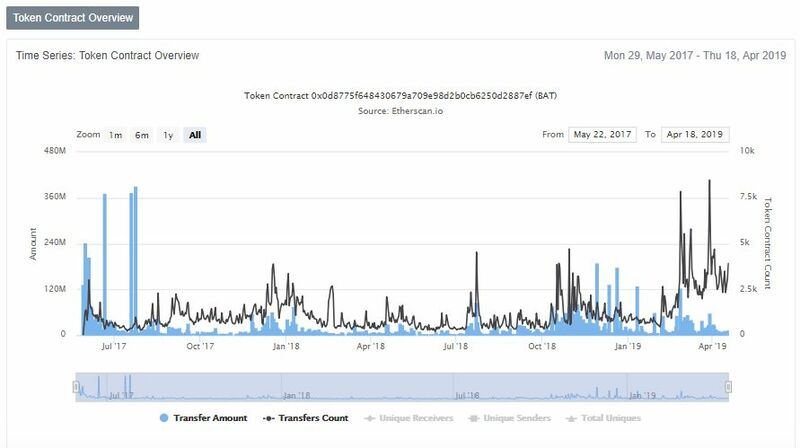 With preliminary indicators predicting a further collapse in the correlation between digital assets and BTC, an altseason might already be well underway. 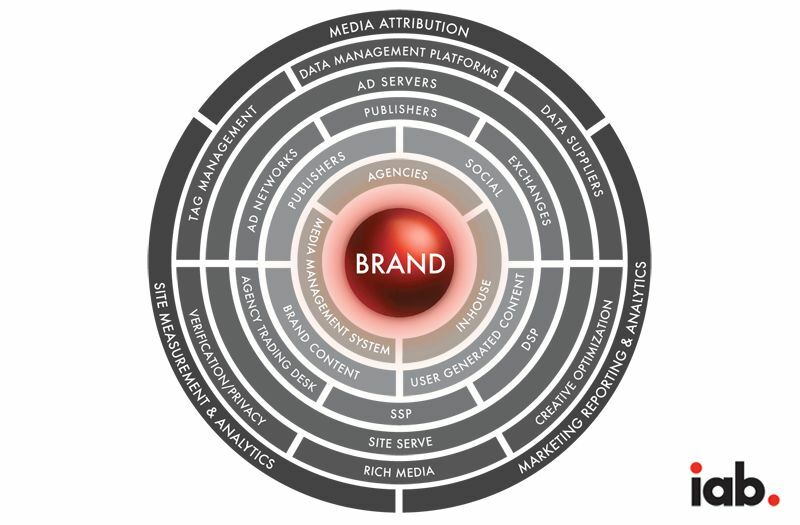 If you take a brief gander at CoinMarketCap or other analytics providers, this would seemingly be the case. Binance Coin (BNB) recently surpassed its all-time high, in a brutal bear market no less, as Litecoin has rallied by over 200% since December’s low. 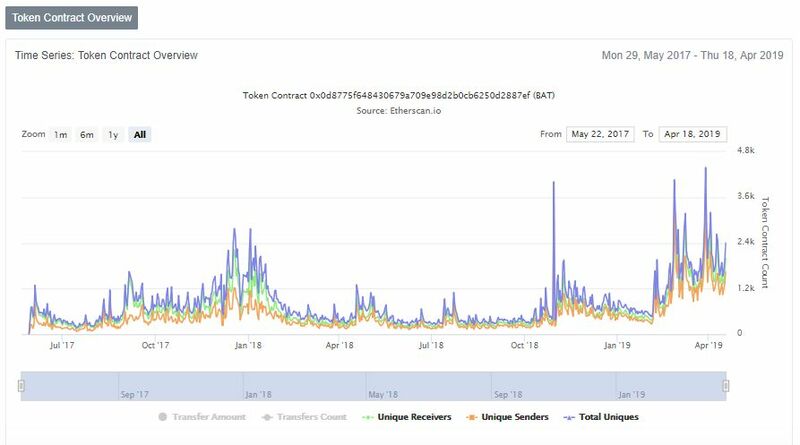 Cardano, Ethereum, Tezos, and Basic Attention Token are among other prominent cryptocurrencies that have also seen jaw-dropping gains in the past 90 days. But, this surge might just be the tip of the iceberg. 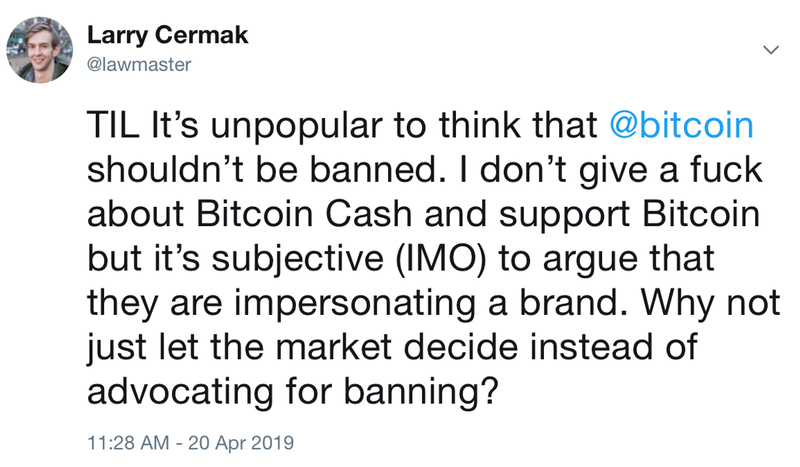 While Lee is hinting that the fabled altseason is finally here, this isn’t to say that he is bearish on Bitcoin. Far from, in fact. In a recent CoinTelegraph Youtube segment, the analyst claimed that the Bitcoin Misery Index, a measure meant to determine the average sentiment of a cryptocurrency holder, reached 89 — the highest the signal has ever read in a bear market. In the eyes of Lee, this confirms that BTC is out of a bear market, as x > 67 readings only came during bull markets. He adds that as Bitcoin has held above its 200-day moving average for an extended period, he is fairly convinced that bears are finally biting the dust.